Plan 9 from Outer Space (originally titled Grave Robbers from Outer Space) is a 1959 American independent black and white science fiction-horror film, written, produced, directed, and edited by Ed Wood, that stars Gregory Walcott, Mona McKinnon, Tor Johnson, and Vampira. The film also posthumously bills Bela Lugosi as a star (silent footage of the actor had actually been shot by Wood for another, unfinished film just prior to Lugosi’s death in August 1956). 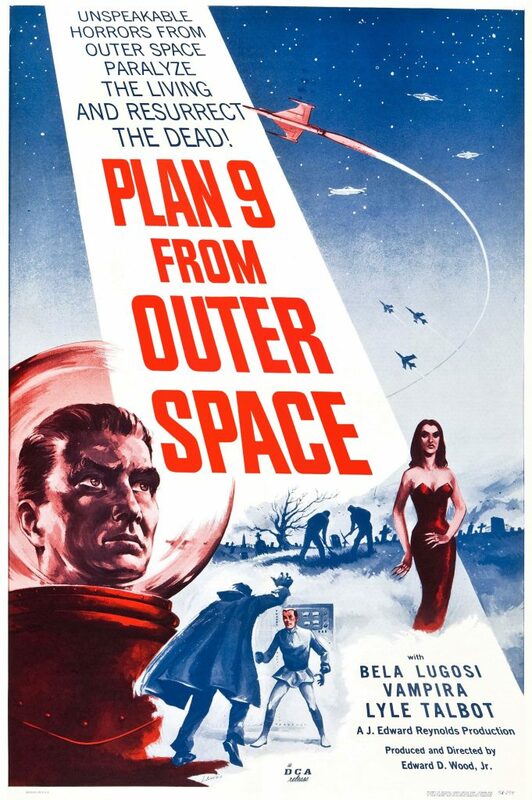 Plan 9 from Outer Space was released theatrically in 1959 by Distributors Corporation of America (as Valiant Pictures). The storyline concerns extraterrestrials who are seeking to stop humanity from creating a doomsday weapon that could destroy the universe. The aliens implement “Plan 9”, a scheme to resurrect the Earth’s dead, referred to as “ghouls”. By causing chaos, the aliens hope the crisis will force humanity to listen to them. If not, the aliens will then destroy mankind with armies of the undead. Plan 9 from Outer Space played on television in relative obscurity until 1980, when authors Harry and Michael Medved dubbed the film the “worst movie ever made” in their book The Golden Turkey Awards. Wood and his film were posthumously given two Golden Turkey Awards for Worst Director Ever and Worst Film.